When choosing your new garage doors, it’s important to think about the practicalities of which type would be the best suited to your needs. We thought we’d put sectional and roller garage doors head-to-head to help you decide which is best for you. How do Sectional Garage Doors Work? Sectional garage doors are constructed of horizontal panels (usually between 3 to 8) which rise vertically, then glide horizontally back into the garage. Runners on the ceiling accommodate the horizontal panels as the slide into the garage. A stylishly practical option, sectional doors are usually fitted behind the garage opening. • They open and close with minimum effort. • They don’t require any space outside the garage to open, so vehicles can park very close to the garage before opening. • They offer a high level of heat and sound insulation. • Design is not limited – there’s lots of choice in panel design, colour, paint finish etc. • Can have glazed window panels, allowing light to flood into the garage. • Secure – each panel has its own connection to the door track; increasing reliability and robustness. • Quick to open in an emergency, and can be manually opened. • They require space inside the garage for the horizontal runners to operate. The Garage Door Team sectional garage doors are available in either glass reinforced plastic polyester or steel. They are maintenance-free and highly durable. How do Roller Garage Doors Work? 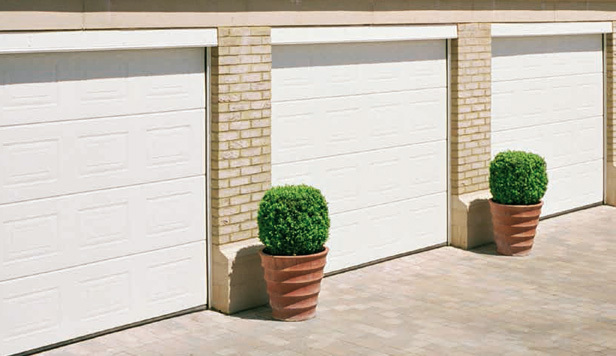 Roller doors are constructed from horizontal ‘slats’, which tightly coil around a drum installed behind the garage opening. • Compact and neat, with no internal tracking. • Can be installed without a frame, so you enjoy maximum drive-through use both in terms of height and width. • Can be fitted to almost any shape of garage opening either inside, in-between or in front of the aperture. • They require more headroom to accommodate the curtain roll. • The only design option is horizontal lines, so the only design elements which can be changed are colour and surface finish. • Take longer to open in an emergency, as the door still has to coil around the curtain roll. The Garage Door Team roller garage doors can be enhanced with a remote control system, allowing you to open and close your door from the comfort of your car. This gives you added security and safety to put your mind at ease. Our roller garage doors can be either insulated or non-insulated, and come in a wide range of colour options, providing a smart but low maintenance finish.